Published: Oct. 9, 2016 at 10:43 p.m. Updated: Oct. 11, 2016 at 07:56 p.m. Opportunity is the name of the game in fantasy football. Talent matters, of course, but we want players who see a healthy volume of targets and touches to anchor our lineups, especially in daily fantasy. Every week in the second season of the Opportunity Report, we'll look at all the passing targets for every NFL team and the percentage each player owns. Franchise will handle the backfield touches section this year and his Week 5 piece is tabbed above. We should have seen this one coming. Drew Stanton threw 28 passes but completed just 11 of them. It's generous that he was even able to elevate two of their top-three weapons in the passing game. Players like John Brown will be back to the output we saw from them in Week 4 once Carson Palmer is back in action. One player who it's time to completely revise expectations for is Michael Floyd. Only on the field for 33 percent of the team's snaps, this was the second week in a row Floyd lost playing time to both John Brown (94 percent) and Jaron Brown (45 percent). Until something changes, the ship has sailed on his breakthrough season. Julio Jones has target totals of eight, five, seven, 15 and six through the first five weeks. From a usage standpoint, one of his games looks like a clear outlier from the rest. Jones is capable of busting out in any game no matter the target load, but we've already seen the floor in two games with Jones playing in this newly constructed distribution. And if you don't think things have changed, you're fooling yourself. Julio Jones owns a 24.5 percent of the team targets and averages 8.2 targets per game through five weeks this year. In 2015, he owned a 32.9 percent share and 12.7 targets per game. The Falcons are winning games; they have little reason to change this. They are getting excellent play from other players, most notably running back Tevin Coleman. The second-year back leads the NFL with 129 yards accumulated when lined up in the slot. Offensive coordinator Marc Trestman was fired Monday morning, so it's fair to wonder if the passing distribution shakes up in the wake of his departure. Then again, it seemed the impetus of his dismissal was his refusal to ride a red hot running game on Sunday with Terrance West only getting 11 carries despite averaging over eight yards per attempt. You can see what kind of neutered attack the Ravens put on the field in Week 5 with none of their pass catchers exceeding 10 yards per catch. Steve Smith left with an ankle injury and was unable to return. Dennis Pitta (74 percent) still played ahead of Crockett Gillmore (68 percent) but the two nearly split the target load. Pitta could become more of a fixture with Trestman gone, as he's a big Joe Flacco favorite. Frustration was brewing between the quarterback and his offensive coordinator when Flacco bemoaned the dink-and-dunk nature of the offense. The situation boiled over when the Super Bowl passer called the unit "embarrassing" after yesterday's loss. If Flacco has more of a say in the offense, we can not only expect him to look Pitta's way more, but also uncork deep shots to developing former first-rounder, Breshad Perriman. While we liked Robert Woods' usage the last two weeks with Sammy Watkins out, this was a reminder of the possible low floor due to the lack of overall passing volume in Buffalo. Without Watkins in this fold, all of these players have that low floor and the ceiling is also capped due to their own individual talents. Justin Hunter caught a touchdown in this game. That's a thing that happened. With Derek Anderson under center we expected him to just feed his top-two options. That could not have possibly been more true. Greg Olsen and Kelvin Benjamin combined to handle 78.5 percent of the Panthers' team targets Monday night. That duo will always be the engine of the Carolina passing offense, but expect Cam Newton to spread the ball around next week in New Orleans when he returns. Corey Brown and Ted Ginn will get favorable matchups with the Saints corners. Devin Funchess played just 38 percent of the snaps and is not at all a factor right now. Anyone but Alshon Jeffery, so it seems. Cameron Meredith (95 percent) played more snaps than Alshon Jeffery (92 percent) and handled a team-high 29.3 percent of the team targets. Meredith is an athletic talent standing at 6-foot-3 and carrying a sub-4.5 40-yard dash time. We shouldn't rule out that he grabs a role on this team with Kevin White now on IR for the foreseeable future. One thing is for sure; this team does not show any signs of an interest in making Alshon Jeffery a featured player in the passing game and the veteran wideout was noticeably frustrated with that today. The Bengals got blown out in Dallas and did not score until there were 10 minutes left in the fourth quarter. They barely possessed the ball for extended stretches and by the time they were move, A.J. Green (84 percent of the snaps) was getting preserved on the sideline. The Browns had the fifth player of the season take quarterback snaps for them this week after Charlie Whitehurst stepped in. With the constant turnover at the quarterback position it is nearly impossible to get a read on what the distribution should look like. It did appear that the depth quarterbacks wanted to rely on Gary Barnidge in the middle of the field. It may not matter for fantasy much at any point this year, but the team does look like they want to get rookie Ricardo Louis involved as a deep threat. He played 67 percent of the snaps and had an average depth of target over 22 yards down the field. Missing Dez Bryant once again did not hinder the Cowboys passing attack, which is quite clearly just a complement to their dynamic running game. Dak Prescott had just a 7.5 average depth of aimed throw in Week 5, which ranked 21st among starting quarterbacks. He has thrown the fewest (seven) passes that traveled 20-plus yards in the air this season. It's fair to wonder if there will be more of a downfield element to the passing game when Dez Bryant is re-integrated in the offense, or whether he just won't mesh with the way Dallas is currently operating. The Broncos have the most predictable distribution in the NFL. Emmanuel Sanders and Demaryius Thomas combine for 55 percent of the team targets and the two running backs are there to pick up the scraps before any other pass-catcher. Devontae Booker's snap share has gone up each week and he caught 80 passes in 23 games in college. He could figure in more as a receiver going forward. The Lions coaches predicted a big game for Golden Tate in Week 5, but the result was a mere three receptions for 39 yards. Tate (32 percent) played on fewer snaps that Anquan Boldin (88 percent) and still carried a miniscule 5.6 average depth of target. However, with Eric Ebron on the shelf for an extended period, expect the multiple receiver set to be the base offense. 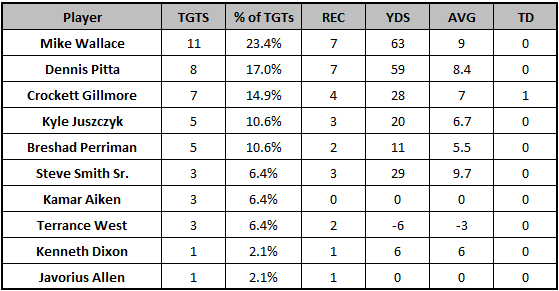 They used at least three wide receivers on 42 plays in Week 5. Janoris Jenkins has been a strong signing for the Giants. He covered Jordy Nelson on 14 pass plays and allowed just 2-29, per Next Gen Stats. However, other players stepped up in his place. Cobb had his best game in weeks-dating back to last year-and that positively correlated with the offense moving at its highest functionality. Even Davante Adams got in on the action. The third-year receiver took a ton of heat for his poor play in 2015, and he earned most of it. Yet, while he is still a mistake-prone player, it's quite clear he is an asset to this team as the third target and much more comfortable not having to be the top outside receiver like he was last season. This distribution of targets is exactly how we should expect to see the Packers chop their passes up going forward. Know that any sort of positivity you see from the Houston receivers came when the game was long since decided. Going into the fourth quarter of this blowout the Texans pass-catchers had 125 receiving yards on 32 targets. This offense is extremely dysfunctional and their next rushing touchdown will be their first. However, you should have seen this kind of game coming for the Texans offense traveling to Minnesota to play the death-trap Vikings defense. Going forward, you should value these players exactly the way you did before their mostly unsatisfying Week 5 outing against a great defense. Yet, it's hard to say that feeling should be overwhelmingly positive. Phillip Dorsett's volume has not grown in the absence of Donte Moncrief. His targets have actually gone down from six to five to four then down to three each of the last two weeks. This came despite playing a team-high 94 percent of the snaps among the wide receivers. He's only a situational deep threat, with an 18.2 average depth of target today, which is right near his 2016 average of 19.9. The only consistent piece of this offense is T.Y. Hilton, who continued his streak of double-digit targets in every game. He's the only wideout to hold that honor this season after Jarvis Landry saw his streak come to an end on Sunday. Hilton has dramatic home/road splits the last two seasons, but he's looking like a low-end WR1 the rest of the way. It took a Benny Cunningham injury for the Rams to realize Todd Gurley can be an asset in the passing game for them. Gurley is an excellent receiver and he has five targets in each of the last two games, which are career-highs. Why it took an injury to Cunningham, an average at best contributor, for the Rams to begin utilizing their best offensive player in a role he fits in well is anyone's guess. The real question is whether Gurley will continue getting targets once Cunningham returns from his injury. Considering it took this for Gurley to even see five targets, it's no sure bet. Running backs on subpar offenses need that receiving workload to elevate their floors, especially ones averaging 2.7 yards per carry. The Dolphins somehow threw only 18 passes in this spot despite an inconsistent rushing attack. The offense did lose a possession to a punt return touchdown and Ryan Tannehill check two interceptions into the teeth of a mediocre Titans secondary. Despite Miami using three wide receivers on 28 of 41 possible plays, DeVante Parker and Kenny Stills only played 80 percent of the snaps each. With Stefon Diggs out for this game Adam Thielen led the way, playing 94 percent of the team snaps. He showed that he is more than a slot receiver, taking 72 percent of his snaps outside and only 17 percent in the slot. He's the rather distant third target on a run-first offense, so there's little every week predictability with him when Diggs is healthy, but the Vikings suddenly look like they have a deep receiving corps. This is a plus, as the team still is in no rush to use their first round pick. Despite Diggs' absence, Laquon Treadwell played just eight snaps. The story of the last two weeks has been Cordarrelle Patterson's reemergence in the Vikings offense. Patterson played the third-highest (49 percent) and second-most (61 percent) wide receiver snaps each of the last two weeks. The Vikings have used him in a hyper-specific role but he's made a difference in each of the past two games. After three years of struggles, it's great to see the Vikings make use of the gifted athlete in way that fits both the team and player. Patterson's upward trajectory has come at the expense of Charles Johnson, who played a measly 12 snaps in Week 5. With Tom Brady back under center, the Patriots began to show their hand a bit more. Their most commonly used offensive grouping today was 12 personnel (1 RB, 2 TE, 2 WR), featuring it on 30 plays. Rob Gronkowski (81 percent of snaps) and Martellus Bennett (69 percent of snaps) look like they will be the focal points of the passing attack going forward. The two-tight end set is officially back in New England. The player whose usage will be most important to monitor going forward is Chris Hogan. The new Patriots receiver went for over 100 yards, but only played 61 percent of the snaps and saw just 12.2 percent of the team targets while missing some time being in the concussion protocol. Hogan was primarily a deep threat with an average depth of target of 24.3 and running a ton of downfield routes. The Giants offense has been completely dysfunctional through five weeks. It's a trend at this point. Despite having one of the best wide receiver trios in the game, a leaky offensive line, unimaginative play-calling and disappointing play behind center is holding their production back. Perhaps once Ben McAdoo gets more experience as the head coach this unit's effectiveness will improve, but for now, we need to adjust expectations for what the players beyond Odell Beckham can do on a consistent basis. Robby Anderson played more snaps (90 percent) than Quincy Enunwa (83 percent), who came into this game banged up. The Jets ran out three or more receivers on 77.6 percent of their offensive plays in Week 5, staying true to their team philosophy. However, with Eric Decker out for an extended stretch, the lack of depth is hurting a team that wants desperately to spread the field. Enunwa's emergence has almost been made negligible with the loss of Decker. With a dearth of wide receiver weapons, Bilal Powell's role continues to expand. He has targets totals of six, nine and eight the last three games and snap shares of 41, 52 and 47 percent after seeing less than 30 percent in the first two weeks. Amari Cooper finally found the end zone on a 64-yard bomb of a touchdown catch. However, he still has yet to register a catch in the red zone, despite seeing two on Sunday and four on the season. Make no mistake, from what we've seen over the course of a season and a quarter, Cooper does have an issue in racking up touchdowns. He has the big play ability to score from anywhere on the field, but he won't see the work inside the 20-yard line like top wide receivers do, unless something changes. Both running backs ate into what was an already shallow passing distribution, handling a combined 13 targets. In what was by far the worst outing of his young career, Carson Wentz hardly elevated his wide receivers. Nelson Agholor led the team in targets, but still played just about 77 percent of the snaps. Dorial Green-Beckham played 51 percent of the snaps, after playing 48 and 46 percent the last two weeks. It wasn't a massive increase in playing time, but the coaches did indeed deliver on their promise to use the talented wideout more. With Agholor not running away with the job, Green-Beckham remains a threat. Oh, and all tight ends score touchdowns against the Lions ... unless they are Zach Ertz, apparently. Sammie Coates played fewer snaps than Markus Wheaton, 58 to 65 percent, but it was clear who the Steelers wanted to get the ball to. The Jets weakness is defending the deep ball and the Steelers made them pay dearly for that flaw with Coates streaking down the field. Coates' route portfolio continues to expand as the weeks go on. Pro Football Focus charged Coates' with four drops on Sunday, and that's been a weak point in his game dating back to his days at Auburn. Yet, considering the Steelers are getting a poor man's Martavis Bryant-type impact from the second-year receiver, they are wise to live with the ups and downs. We know the Steelers average over 31 points per game at home since 2014 and less than 23 on the road, and that will likely be a key variable in deciphering Coates' usability. In home games against equal or inferior components, you'll want to take the same approach Pittsburgh is with Coates; live with the bad in pursuit of the good. Dontrelle Inman was the big winner in Week 4 and still played more snaps (86 percent) than Tyrell Williams (68 percent) and Travis Benjamin (60 percent). However, he is clearly not the focal point of the offense that those two are. He has 19 targets on the season, where Benjamin and Williams have 27 and 22, respectively. Benjamin is running a more complete complement of routes, whereas Williams, despite his bigger frame, is primarily the big play threat. Despite Antonio Gates' return to the lineup, Hunter Henry out-snapped the veteran 41 to 18. Henry has been an upgrade on the aging Gates as the starting tight end, catching five passes for 103 yards and two scores the last two weeks. It's fair to wonder if this should be the split going forward. Jeremy Kerley has 88 yards and 102 yards in back-to-back games to go along with a pair of touchdowns. It does look like he's firmly entrenched as the 49ers top receiver, owning a 30 percent share of the team targets through five games and playing all of the snaps in Week 5. Carlos Hyde had a season-high six targets and he caught every single one of them. His development in the passing game along with 20 fourth quarter carries this season makes his value undamaged by playing on a subpar offense. Hyde already has a career-best 13 receptions. Mike Evans maintained his stranglehold on the NFL's lead in targets (62) through five weeks after handling a whopping 40 percent of the market share on Monday night. There are simply no other reliable pass-catchers right now, and the second-most targeted player had half of Evans' 12 and that was fill-in starting back Jacquizz Rodgers. Additionally, Evans is dominating and looks uncoverable when Jameis Winston can deliver an accurate ball to him. Vincent Jackson is still the No. 2, even if he's not doing much, as Adam Humphries played just 41 percent of the snaps. Marcus Mariota chucked three touchdowns and added a fourth on the ground. It was still a lackluster game in terms of passing yardage, and running back DeMarco Murray was the second-most targeted receiver. Tajae Sharpe once again led the team in wide receiver snaps with an 80 percent share, but he's simply not a No. 1 receiver at this point in his career. After a strong start to the season, Jamison Crowder has gone quiet and is now a sub 60 percent snap player. His playing time dipped in each of the last three weeks from 63 to 57 to 56 percent of the team snaps. Pierre Garcon is clearly the No. 2 receiver in Washington. The target distribution in Washington is deep, and that makes all players after Jordan Reed tough to predict on a week-to-week standpoint.